From the left: Donatella Legnaioli, Honourable; Mattia Armelli, Commercial Director of Analytical Group; Susanna Ceccardi, Major of Cascina; Andrea Di Benedetto, President of Navacchio Techno Park; Giuliano Manara, President of Cubit. 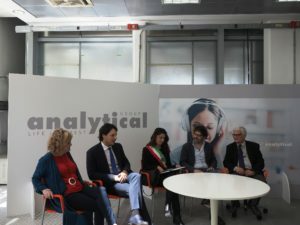 Analytical Group, which has been operating in testing and certification for over 35 years, has announced the opening of a new location at the Navacchio Techno Park (Pisa, Italy). It collaborates with companies of various sectors, with particular attention to the analysis of the environmental, agri-food, electromechanical and industrial sectors. With this new location, Analytical Group will have the exclusive management of the anechoic chamber for the measurement of electromagnetic fields. The advantage for the companies will be to have a single center, located within the Navacchio Techno Park, where it is possible to carry out all the tests related to electromagnetic compatibility for various types of products such as household appliances, lighting products, etc. Analytical Group will be able to offer a complete service quickly with various types of tests, such as pre-compliance tests, environmental tests, reliability forecasts, testing services for obtaining CBReport, CE marking and several international marks to market products all over the world. The new collaboration with Cubit (the consortium company born from the synergy between the Department of Information Engineering – University of Pisa, Polo Navacchio SpA and some innovative companies in the territory) establishes that the consortium company take on the role of Analytical Group’s competence center in the Research and Development area for the Internet of Things. “One of the most important Testing and Certification poles is born in the center-south of Italy in the electromechanical field – said Mattia Armelli, commercial director of Analytical Group -. We are enthusiastic about this partnership with Cubit and Navacchio Techno Park, which gives Analytical Group the opportunity to extend its accreditations and its certification possibilities also in the IoT and wearable device field, and gives the companies the possibility to have a unique partner for the international certification. In fact, we strongly believe that smart and connected objects will be increasingly present in people’s lives, and for this reason we want to be at the forefront. The new location at the Navacchio Techno Park adds the possibility of collaborating with excellence centers such as the University of Pisa and, at the same time, with the new start-ups that may need a partner like us. For the new center, we plan to invest about 200,000 euros already from the first year and by 2020, and to hire up to 10 employees”.